Add the sugar and water to a saucepan under medium heat. Stirring occasionally, heat until the sugar is dissolved, about 5 minutes. You want the mixture to get hot but not boiling. Pour the contents of the 3 envelopes of gelatin into the saucepan and stir until the gelatin is completely dissolved. Remove from heat. In a large mixing bowl, add the lime juice and mint leaves. With a muddler or wooden spoon, muddle the mint leaves slightly. Add the hot gelatin mixture and cover the bowl for 10 minutes to steep the mint leaves. Once the mint has steeped, remove the mint leaves from the mixture and add the rum. Stir well to incorporate. Place the plastic soufflé cups on a baking sheet and pour the mixture into each cup, filling almost to the top of each rim. 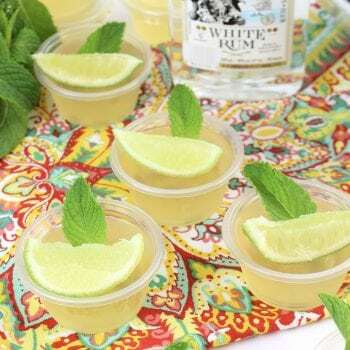 Before serving, add a lime wedge and mint leaf to each Jell-O shot.